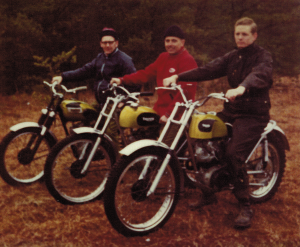 Back in the 60’s Jim Foster, Bob Smith and Wayne Slate, (my Dad) had “custom” Triumph Cubs. 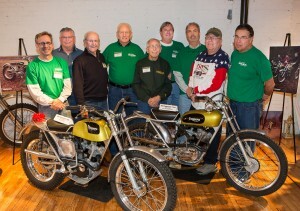 The bikes all had a larger 21” front wheel, custom seats, polished aluminum fenders, and green and black paint schemes. My Dad’s also had a special two-in-one gas/oil tank. Knowing Jim had some spare parts, I told him that if we could find that “special” tank that I would like to build a replica of my Dad’s bike. 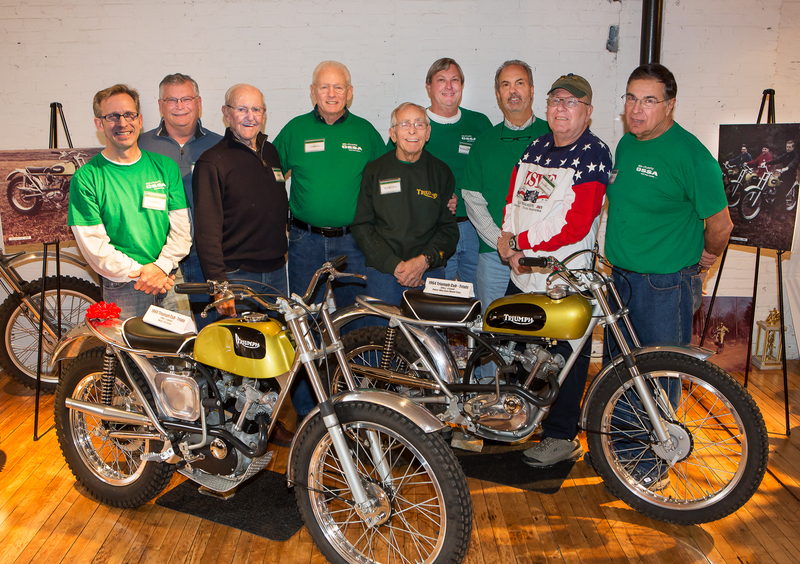 In early 2011, Jim said, “Suppose we build it anyway…perhaps with a stock tank?” By the end of the week I had a cruddy frame, some fork parts and the bottom end of an engine that looked like it had been underwater. With some freshly powder coated hubs and backing plates complete with axles, compliments of John Melniczuk, we were off and running. BUT…I just couldn’t stand the thought of a stock tank, so I went on eBay and found, as an alternative, a nice slim fiberglass tank…OK…but not exactly what I wanted. A week later at the York swap meet, there it was…that “special” gas/oil combination tank. I couldn’t believe it! I showed my Dad and he verified that it was indeed “the” tank. We were cooking now! All the while I was collecting more and more spare parts. I had handlebars, tires, a rear wheel and a front end. Ahh…what to do now? Build a replica of Jim’s Cub too…this one in secret…and surprise him with it as a gift! We found a frame, then cut, ground, welded and modified it before sending it off to be “nickel/chromed” just as the original “Trials Cub” had been back in the day. John Melniczuk built both engines from his parts supply. Wayne’s was an earlier “round barrel” setup, and Jim’s was the later “square barrel”. Upgrades included electronic ignition, countershaft sprocket access, modified breather system, valve guides w/seals, custom clutch pressure plates, and the list goes on…! We couldn’t have completed the project without John’s help…MANY THANKS! View more restoration photos by clicking here!